Recording your own greeting is easy and doesn't require any custom software. It's all available online. 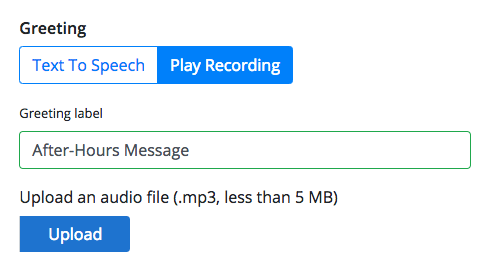 We recommend Online Voice Recorder, which allows you to record your greetings, trim the start and end points, and then download them as MP3s. You can then upload those MP3s to Keypad, or send them to us for your Smith.ai after-hours messages. To make sure your greetings sound great, please take a look at our 5 Tips for a Perfect Voicemail Greeting. Once you have the MP3, please send it to us and tell us how you'd like it to be used. More information here. You can upload your greetings anywhere you see the option to Play Recording. The file is now in the Keypad system. You can optionally choose Replace to replace it with a different file. Alternatively, you could save yourself some time and hire an affordable professional. Smith.ai recommends Fiverr’s Voiceover talent. Starting at just $5, you can purchase a customized voicemail greeting, ready in just a few days. Many of our current small businesses and entrepreneurs have messages provided by Fiverr’s talent — we think they provide top-notch service.